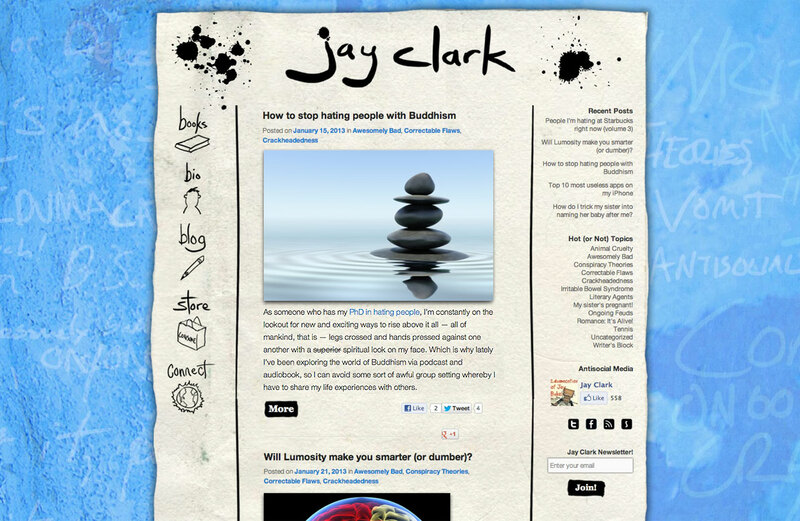 Humor writer Jay Clark already had a web site when he came to us, but it was in dire need of an upgrade. In short time, we ported his content into a shiny new layout that better reflects his lighthearted spirit. All of the navigation options are hand-drawn in an ink-on-paper style that stands apart from standard fonts, and the site’s content all rests upon a textured page that pops out from the bright blue background. Jay Clark is the author of young-adult novel The Edumacation of Jay Baker. He uses his web site to provide his readers with entertaining short stories and news updates.Jay Clark is the author of young-adult novel The Edumacation of Jay Baker. He uses his web site to provide his readers with entertaining short stories and news updates.